Getting a small unmanned aircraft to fly aggressively and autonomously through an unknown, cluttered environment creates substantial challenges for the vehicle's navigation and control. Without a prior map, the vehicle has to detect obstacles and avoid them, often on the basis of little sensor data, and make rapid decisions about how to move around given an uncertain and incomplete model of the world and the vehicle¹s position. I will discuss some recent results from my group in developing approximate inference and planning algorithms that have enabled fast and aggressive autonomous motion for unmanned vehicles. Nicholas Roy is an Associate Professor in the Department of Aeronautics & Astronautics at the Massachusetts Institute of Technology and a member of the Computer Science and Artificial Intelligence Laboratory (CSAIL) at MIT. He received his Ph. D. in Robotics from Carnegie Mellon University in 2003. His research interests include unmanned aerial vehicles, autonomous systems, human-computer interaction, decision-making under uncertainty and machine learning. He spent two years at Google [x] as the founder of Project Wing. Motivated by recent interest in Unmanned Micro Air Vehicles (UMAVs) aerodynamics, the present study is focused on obtaining a simplified, vortex-array model of the unsteady flow in the wake of an airfoil undergoing small-amplitude but high-reducedfrequency pitch oscillations. The model is used to compute the mean and unsteady velocity field in the wake of a NACA 0012 airfoil executing sinusoidal as well as nonsinusoidal pitch oscillation. The model’s accuracy is assessed by comparison to LDV measurements at chord Reynolds number of 12,000 and a reduced frequency as high as 10. The results demonstrate the ability of the vortex-array model to successfully reproduce the experimentally measured mean and phase-averaged streamwise velocity profiles in the wake of the airfoil. Moreover, by using the model to reconstruct the cross stream mean velocity profile in the wake, the average streamwise force acting on the airfoil is computed for different frequencies and amplitudes of oscillation. The computed force coefficient is found to agree well with computational and experimental data in literature. Subsequent to its verification, the model is utilized to explore the thrust force dependence on parameters of the wake vortex pattern; i.e. circulation and streamwise/cross-flow spacing of the vortices. Insight from this exploration has the potential for providing a rational approach for manipulation of the trailing edge flow in order to obtain desirable force characteristics for flapping-wing UMAVs. 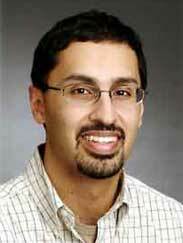 Ahmed Naguib is currently Professor in Mechanical Engineering at Michigan State University. He served as the Associate Chair for the Graduate Program from 2012 to 2014. His BS degree is from Ain Shams University, Cairo Egypt, and Master and Ph.D. degrees are from Illinois Institute of Technology, Chicago, USA. His research interests are in experimental fluid dynamics and associated applications, particularly in the field of turbulence and flow instability physics and control, unsteady aerodynamics as well as development of measurement techniques. Prof. Naguib’s work has resulted in more than seventy conference and journal publications, two book chapters, and three patents. He has also been an Associate Editor of the American Institute of Aeronautics and Astronautics (AIAA) Journal since January 2009 and he was awarded the AIAA Associate Fellow grade in 2012. Fixed-wing aerial robotic technology has advanced to the point where platforms fly persistent sampling missions far from remote operators. Likewise, complex atmospheric phenomena can be simulated in near real-time with increasing levels of fidelity. Furthermore, cloud computing technology enables distributed computation on large, dynamic data sets. Combining autonomous airborne sensors with environmental models dispersed over multiple communication and computation channels enables the collection of information essential for examining the fundamental behavior of atmospheric phenomena. This paper describes progress toward the development of an autonomous airborne scientist for studying severe local storms. This autonomous scientist combines unmanned aircraft systems, meshed networked communication, cloud computing infrastructure, online and offline numerical weather models, and new onboard sensors. The existing system architecture will be described along with results from recent field deployments validating and assessing various subsystems. Dr. Eric W. Frew is an associate professor in the Department of Aerospace Engineering Sciences and Director of the Research and Engineering Center for Unmanned Vehicles (RECUV) at the University of Colorado Boulder (CU). He received his B.S. in mechanical engineering from Cornell University in 1995 and his M.S and Ph.D. in aeronautics and astronautics from Stanford University in 1996 and 2003, respectively. Dr. Frew has been designing and deploying unmanned aircraft systems for over fifteen years. His research efforts focus on autonomous flight of heterogeneous unmanned aircraft systems; distributed information-gathering by mobile robots; miniature self-deploying systems; and guidance and control of unmanned aircraft in complex atmospheric phenomena. Dr. Frew was co-leader of the team that performed the first-ever sampling of a severe supercell thunderstorm by an unmanned aircraft. He is currently the CU Site Director for the National Science Foundation Industry / University Cooperative Research Center (IUCRC) for Unmanned Aircraft Systems. He received the NSF Faculty Early Career Development (CAREER) Award in 2009 and was selected for the 2010 DARPA Computer Science Study Group. The Centre for Aerial Robotics Research and Education will feature NSERC'S Collaborative Research and Training Experience (CREATE) Program in Unmanned Aerial Vehicles trainees giving presentations explaining their research. The industry partners, companies, and government or non-government organizations will be invited to attend and will also present their work as well as their issues or challenges that the CARRE program is hoping to find solutions for them. It is an opportunity for industrial and academic partners of UTIAS to network with each other, learn about current research at the institute, and meet prospective graduate interns. The CREATE trainees will also interact with symposium speakers and guests, to gain experience and have access to global perspective. This will increase their contact with industrial leaders outside their internships. 11:10 Lingzhu Xiang - Optimal Trajectories for UAV Sensor Self-calibration.